I then took the output files created here, and processed them in ArcGIS using the cost distance tool. The results from both the scikit-image approach I coded and the ArcGIS results are shown in the picture at the top of the page. The key take home point is that they are, with the exception of some rounding issues beyond the third decimal point, identical. 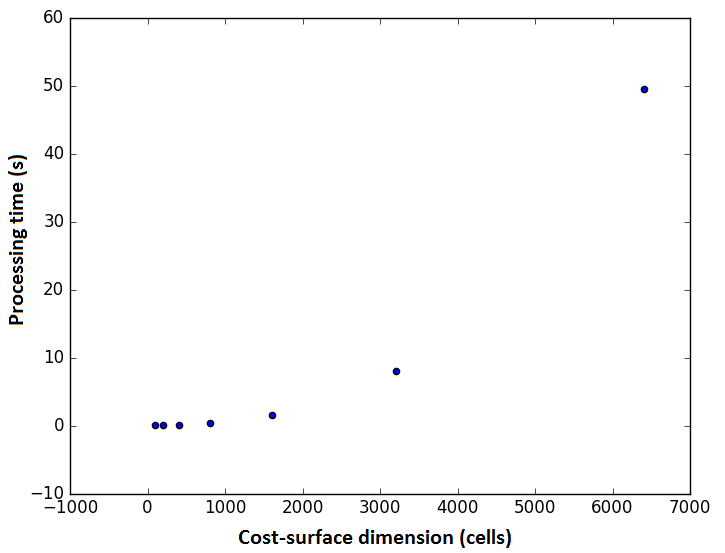 So I'm now confident in saying that the graph module of scikit-image does allow you to do least-cost modelling. 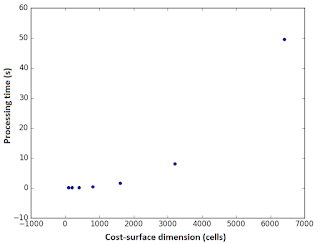 As you can see from the plotted results below, even on my laptop that only has 8GB of RAM, cost-surfaces with dimensions of over 6000 cells can be processed in less than a minute. From my experience with other GIS software, I think this speed is at least reasonably comparable, and certainly is fast enough to be used within my own research. Of course there is a power relationship between the dimensions and the speed, so there will eventually be an issue with processing cost-surfaces that are much bigger than those I have used here. Etherington TR (2016) Least-cost modelling and landscape ecology: concepts, applications, and opportunities. Current Landscape Ecology Reports 1:40-53.
van der Walt S, Schönberger JL, Nunez-Iglesias J, Boulogne F, Warner JD, Yager N, Gouillart E, Yu T, Scikit Image Contributors (2014) scikit-image: image processing in Python. PeerJ 2:e453. Hello! My name is Thomas Etherington. This blog records some of my experiences of applying geoinformatics methods to geography and ecology.